Lava from Kīlauea Volcano’s current Leilani Estates Flow on the Big Island of Hawai‘i has now consumed 82 homes since the eruption began on May 3. Pele continues to pour her molten rock into the ocean just southwest of Pohoiki. Numerous fissures continue to spew lava, some fountaining, others oozing. More fissures have now opened up atop the May 6th Luana and Makamae flow just below… the most recent, a small outbreak at the top of the May 6th flow between Luana and Nohea. Those fissures are spreading lava in both directions… across Leilani to the north, and toward Malama to the south, and downslope… picking off houses one by one. Huge cracks have appeared half way up the subdivision, particularly on the Malama side of Pomaikai. 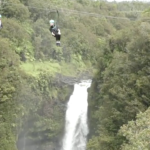 Over the past several days, Pele has ventured uprift… the question remains… how far up will she go? Also of note are fissures 5 and 6 at the bottom of Leilani. They have gone from oozing to fountaining, destroying several structures at the old state Geothermal test site and are now creating a “perched pond,” now a raised thirty-foot tall lava lake between the fissures. Meanwhile Fissure 22, the largest of them all, is holding a steady volume, after a recent slow down. 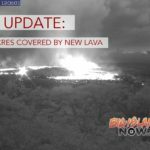 The uptick in activity near the PGV Geothermal plant has not moved lava much closer to the facility… instead, the breakouts nearby have been pouring a huge volume of lava downslope and ponding. Both a’a and pahoehoe flows continue to pour over the sea cliffs in great volume just southwest of Pohoiki. Numerous fingers of lava have stretched toward the sea over the past several days, covering many properties, and destroying many homes… leaving others and their owners wondering what’s next. Although it began in Leilani on May 3rd, and burned several homes there, she soon established her vents below the subdivision with towering fountains, spatter cones feeding gigantic lava flows. So far, no deaths have been reported. Pohoiki Road and Highway 137 have both been covered with lava, but Highway 132 is still open as of this writing. More tomorrow!